Clayton Keller, who scored twice in Saturday’s 4-1 win over Notre Dame and assisted on BU’s only goal in Friday’s loss, was named ProAmbitions Rookie of the Week for the fifth time this season. He’s also been named Rookie of the Month for December and January. Keller is the top freshman scorer in Hockey East games with 27 points in 18 games, despite missing four games due to injury. Kieffer Bellows, with a goal and an assist in Saturday's win, and Jake Oettinger who made 63 saves in the Notre Dame series, were named to the weekly top performers list. 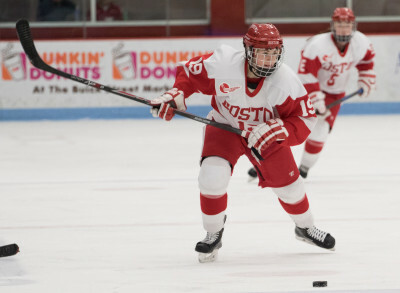 ►Terriers fell one spot—from sixth to seventh—in the USCHO weekly poll, switching place with Union. BU also slipped one spot to sixth in the USA Today/USA Hockey Magazine poll. 2020 recruit Dylan Peterson played in the HEO Bantam AAA All-Star game and recorded a pair of assists. The standout forward for Canada International Academy leads the major bantam team with 48 points (23G, 25A) in 30 games. 2020 recruit Trevor Zegras scored his 17th goal in Avon Old Farms’ 3-3 tie with Loomis. He finishes the regular season with a 17-17-34 line in 25 games. Not often you see an odd-man rush like this. Evan Rodrigues and Jack Eichel scored both goals for Buffalo in the Sabres’ 3-2 loss to Arizona. Eichel also assisted on Rodrigues’ goal. For Erod, it was his second goal in two games and his fourth point in eight games since being recalled from Rochester earlier this month. Colin Wilson scored his 10th goal in Nashville’s 5-4 win against Edmonton. Terriers have advanced to the Hockey East tournament semifinals after another comeback win over New Hampshire. 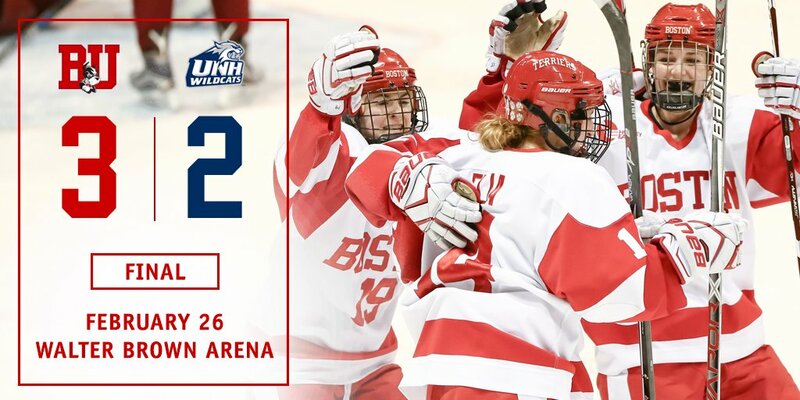 The 3-2 victory in game three completed BU’s comeback after dropping the first game to the Wildcats. Third seed BU advances to the semifinals and will host second seed Northeastern next Saturday while BC and Vermont will meet in the other semifinal. UNH got on the board just 17 seconds into the game, but BU quickly responded with goals from Samantha Sutherland, on a power play, and Rebecca Leslie. The visitors scored the only goal of the second period, knotting the score and leaving 20 minutes to decide which team would advance. Leslie scored her second of the game, this one a power play tally during a scramble at the goalmouth. BU survived a late New Hampshire power play that became a 6-on-4 with the goalie pulled. Victoria Hanson made 27 saves for BU. The win was the 250th career victory for Head Coach Brian Durocher who has been behind the BU coach for all 12 of the program’s varsity seasons. 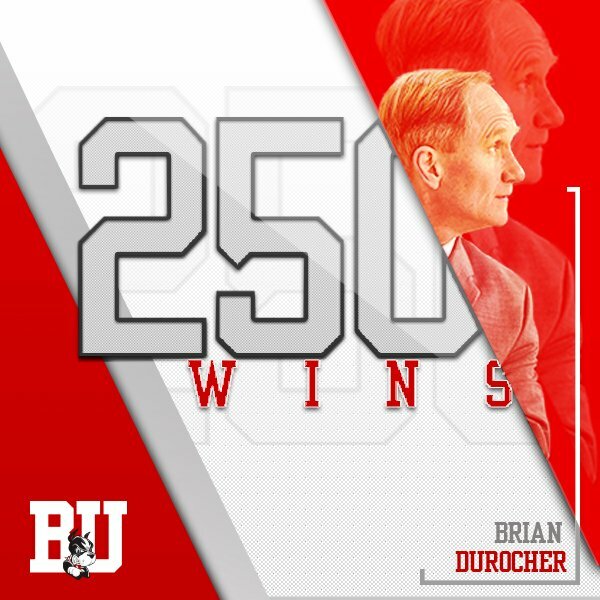 Durocher was previously an assistant coach of the men’s team under Jack Parker and was co-captain of BU’s 1978 national championship team. Leslie, with three goals in the conference quarterfinal series, and Alexis Crossley with two scores, were named to Hockey East’s weekly list of top performers.